I’m using the Eclipse NXP Kinetis Design Studio v3 with a NXP FRDM (FRDM-KL25Z, as the most popular board). But any other IDE or board would be applicable too. I’m using Processor Expert to set up the shell (serial) communication interface, but you could use any kind of driver too. It is just that with Processor Expert it is very portable, generic and super easy to do :-). If you like, you can use the Kinetis SDK or anything else with the same concept. In this project I’m using Processor Expert without the Kinetis SDK. I’m using a few components from the McuOnEclipse project (see “McuOnEclipse Releases on SourceForge“). In the first step, create a project with your IDE. 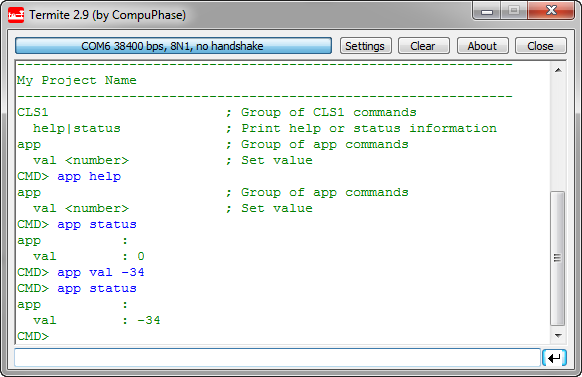 I have created a project for the NXP Kinetis KL25Z with Processor Expert enabled. This mean we are going to use the Serial (UART) on the board. The ‘Serial’ is a pre-configured ‘AsynchroSerial’ component. 💡 If using another board, check your board schematics and change the UART and pin assignments. If I put this into an into an endless loop inside main and add a delay of 1000 ms, it will print the messsage every second. 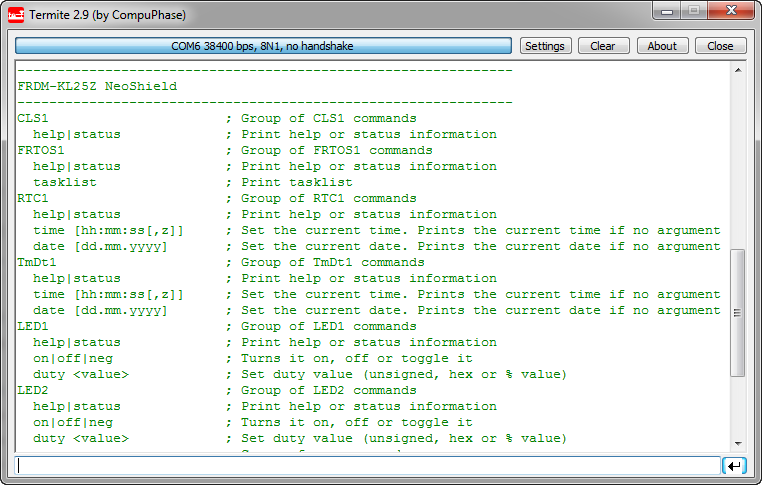 It parses the incoming command (cmd). If the command has been recognized, it returns TRUE through handled. It does not need much to have a command line interface to the application. It only needs little resources, but adds big user and debugging value to most projects. Most of the time it makes sense to run the application with an RTOS and run the shell as a dedicated task. But as shown here, it is easy in a bare metal environment too. The project created in this tutorial is available on GitHub here. This entry was posted in ARM, Boards, CPU's, Eclipse, Embedded, Embedded Components, Freescale, KDS, Kinetis, KL25Z Freedom Board, NXP, Processor Expert, Shell, Tips & Tricks and tagged arm gcc, Eclipse, Embedded Component, freedom board, Freescale, gnu gcc, KL25Z Freedom Board, open source projects, Processor Expert, Tips&Tricks by Erich Styger. Bookmark the permalink. This would be great if AsynchroSerial was an option for the KV series. Do you have any tips (or a guide) on what is needed to extend this support? Thank you! I’ll try to test it!! Hi Erich – trying to follow this on a clean KDS installation. 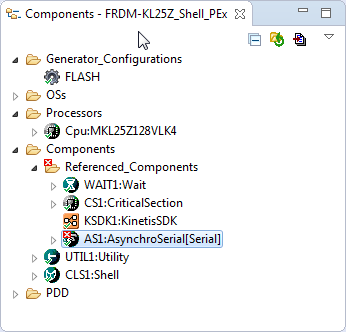 I’ve picked up KinetisTools_09.02.2016.PEupd from SourceForge, Processor Expert -> Import Components. 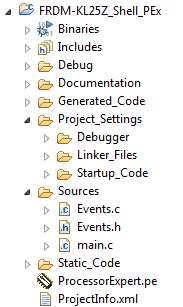 Even with filtering off, and after a restart, I can’t see any of your components in Components Library. I saw an “updating supported processors” message when I did Import Components – so assume that worked. ‘Creating referenced component’ has encountered a problem. Error during adding referenced component/template “Unsupported-Utility/UNSUPPORTED”. Component is either missing or corrupted. I do not see the Download Zip button in the GitHub. I am log in with my account GitHub. Wow amazing I tried for my KE-02Z controller and its amazingly working. Have you wrote any code for sending a file through Shell ? I saw your brilliant boot loader article where you have successfully sent your application file. If you have any article for sending a s19 file with the help of Shell, kindly share the link sir. Hi sir, sorry for being over anxious in sending another query before getting the reply for the current query. But sir, actually Hello world code worked fine. you have the function ReadText() inside the function main(). This is not possible in C/C++. You have to write the function outside the main() function. the current implementation of the Shell component only deals with ASCII data. Loading S19 files would be possible, but is currently not implemented. Oh thanks. Ill put it outside the main function and will try to debug the code. So S19 files are possible right. Do you have any articles to load S19 files. I want to get familiarized with this amazing SHELL component before starting to design a boot loader. That is why am asking you is there any specific articles to Load s19 files and see the output in Terminal. I tried your shell example and for some reason it is just spilling out gibberish. The ‘Shell’ function is the only thing i have added to main. Make sure your baud settings are correct. 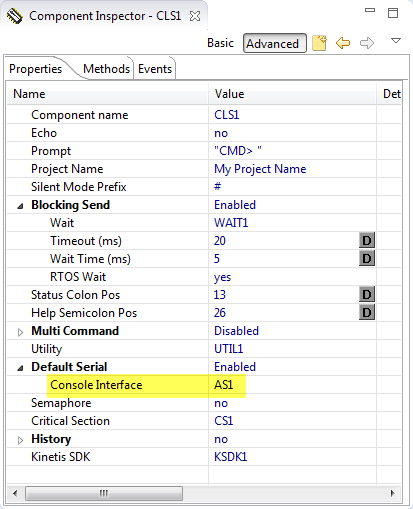 Additionaly, in the AsynchroSerial components, have the interrupts enabled and specify buffers for 32 or more for RX and TX. Erich, I tried adding the Shell component to a FRDM-KL26Z board today. 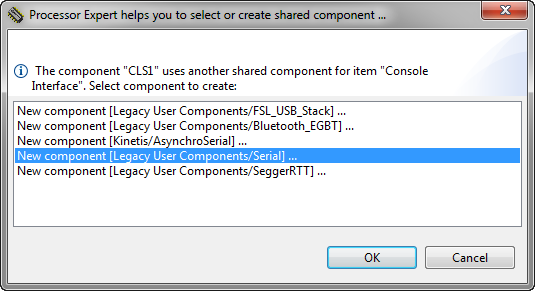 At the step where it asks which component to use for the console/serial interface, it reported “New component [My Components/Serial] (unsupported on MKL26Z128VLH4)”. Is this a KSDK v1.3 vs v2 issue, and do you have any suggestions on how to resolve it ? yes, this is a KSDK issue: the SDK does not support the needed/required serial components. Best if you do not use the SDK for that KL26Z project. First of, thanks a lot for helping with all these concepts, not sure how I would learn without your blog. I’m trying to implement this on my K64F board, and for some reason if I have interrupts enabled in AS1 (64bytes for Rx/Tx), nothing comes through to my terminal. On the other hand, disabling interrupts allows me to transfer everything through. not sure what this is, except can you check that interrupts are really enabled? Check the PRIMASK register (registers view) if interrupts are really enabled (0)? I’ve checked primask register and it comes out as 0x0. I guess that is what it should be? Into void AS1_OnRxChar(void), it appears to respond to my terminal commands well. More so, if I stick CLS1_SendStr(…) into that interrupt routine, it also prints everything out. However, if I leave all events empty and put the CLS1_SendStr() into main(), nothing comes out to my terminal. Just to verify, in you guide you only programmed in main(), right? Could this in any way be related to my machine running Windows 10? Yes, a value of zero in PRIMASK means that interrupts are globally enabled. really hard to tell. Maybe you can send me your project to the email address listed on https://mcuoneclipse.com/about/ and I try to have a look? I just noticed, that after running PE_low_level_init(); line PRIMASK register becomes 0x1. Could this be an issue? Yes, that means that interrupts are disabled. Then your UART driver does not work as it needs interrupts. I’ll have a look at the project you have sent. I had a look at your project: Interrupts are disabled because you are using the RTOS in your project. By default, interrupts are disabled in PE_Low_Level_Init() and are enabled when you start the scheduler with vTaskStartScheduler(). 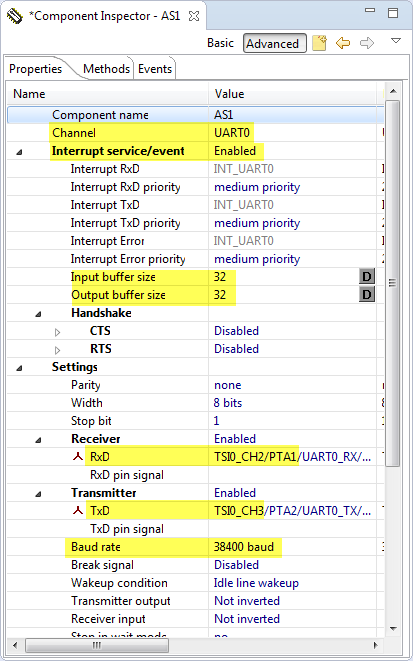 You can control this by the FreeRTOS setting ‘Disable Interrupts in Startup code’. Or enable interrupts with Cpu_EnableInt() (that method is disabled by default in the CPU component, so enable it first). I am having some problems with this project. I have a KE04A8VTG4 processor, and I repeated the steps in this blog post of yours up to the section that starts with Shell Application, and everything works perfectly. (Although I added the shell component first and the util component was added automatically) Oh, Also I am using the RTT_Terminal instead of the AS port, and I have the SeggerRTT component included. At this point if I add another component, (LED should be easy, but it seems like even the HF component also makes it fail), I get an hard fault every time the ReadText function runs. EVEN THOUGH I DIDN’T EVEN CALL the led component I added!!! If I remove the LED component and delete generated code and rebuild and relaunch, it works again. And it seems to not be just the LED component, adding the HF component does the same thing. Hope you can tell me what is wrong here! I have my project with LED and QUAD decoder and some IO pins all working if I don’t want to use the shell (or even just the RTT_terminal would be enough) Update: I just commented out the ReadText() function call, and the CLS1_SendStr(“Hello World”. CLS1_GTetStdio()->stdOut) call works with my LED blinking. This is telling me the problem is in the CLS1_ReadChar(&ch), because that is also where the HF or unhandled interrupt was generated. begins with a semicolon and has too many close braces, so something is missing and I cannot drag and drop your code into my app anymore. My stack was only 0x50 in the CPU component, I upped it to 0x200 but it still failed in the same way. Not sure if RTT should make any difference, but I can try. Nope, I can’t put a uart on the SPI pins that I used. Is there a bit-banged async serial component? I didn’t see one. I designed the board thinking I could use the RTT_terminal. I did not enter anything, and I had that code outside of the CLS1_KeyPressed() check, that’s why it printed always zero. Thanks for checking it out. I still have problems with it – Do you think it might have something to do with the processor being the small KE04 with 8k flash and only 1k RAM? Possible, but I don’t think so, I have used 8K/1K parts too (but not from the KE series). when I removed the XF1_xsprintf, I was able to get it work. It then works if I build my output buffer with various UTIL cat functions. I guess that means the stack was too small. Is there any kind of stack viewer in KDS? First of all, I’d like to thank you because thanks to you and this page I’m finishing my Final Project for getting an electronical engineer degree, since a part of the project is developed in KDS, and I would be stucked without this page. The way to do it is using strncmp for commandA and then the function ScanSeparatedNumbers? 3) I have a warning that says that CLS component doesn’t support clock config 2, but this component supports all speed modes. Should I take care of it? thank you for your kind words, and I wish you success with your degree! 1) Yes, you can use the ScanSeparatedNumbers() function. 2) sizeof(“app val”) returns the size of the object, which is for a string *including* the zero byte. the -1 is to not count the zero byte, so only to compare “app val”. The second line advances the pointer p past “app val”, so points right after that. Again the -1 to compensate for the zero byte (termination byte) in “app val” string. 3) Yes, you can ignore that. or remove the different speed configurations in the CPU component.